Navigating a busy airport is often one of the most stressful parts of the holiday season for any traveler. 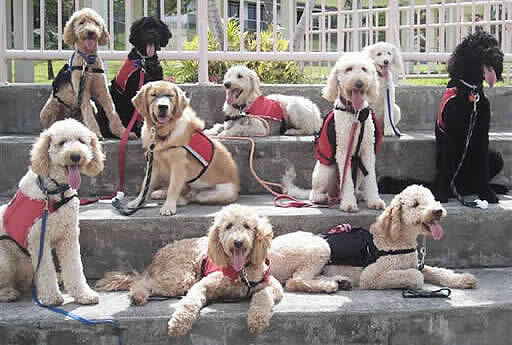 But this year, airports across the country are going to the dogs — therapy dogs, that is, who hope to ease travelers’ stress by offering a brief bout of canine companionship in the terminal gates. During the holidays, many people opt for “experience” gifts over material ones. While some of these experiences can be relaxing or refreshing, there’s an experience that the adventurous types in your life will absolutely love: racing school. If you’re looking for a present to give a car lover or a racing fanatic, why not offer them a lesson at racing school? This year, the best gifts go 120 MPH. While normally you may only inspect your roof once or twice every year, if you plan on hanging Christmas lights this holiday season, you should be prepared to check on your roof more often. As beautiful as they are, the holiday lights that adorn our window frames and roofs can be extremely hazardous. Just this month, on Nov. 3, a home in Beloit, Wisconsin was set aflame by worn-out Christmas lights. On that evening, the Beloit City Fire Department responded to a call regarding a small fire on the home’s exterior. What will you do with your year-end bonus? Some employees may not even be sure they’ll get one. But according to a new survey, more companies are planning to dole out holiday bonuses this year than last — and they’ll be doing so in larger amounts, too. The 2016 Holiday Bonus and Hiring Survey from Accounting Principals, a staffing and recruitment firm for finance professionals, indicates that 75% of employers will offer cash bonuses for their employees, up from 67% last year. The average dollar amount is said to be $1,081, also an increase from last year’s $858 average. There’s no question that electronic services are much better for the environment than paper services, but holiday season means wrapping paper waste is going to be through the roof. Not only does it create a giant mess in your home, it creates a giant mess for the environment. However, there are ways you can help. If you want to impress your friend and help save the planet this holiday season, here are a few eco-friendly ways you can wrap your gifts. Believe it or not, fabric is already a popular wrapping material. On Cyber Monday last year, eBay sold one hoverboard every 12 seconds. These self-balancing electric scooters were the must-have toy of the holiday season. Everyone wanted one; that is, until they started bursting into flames. Chinese manufacturers fiercely competed against one another, cranking out hoverboards as quickly as possible. This race led to an influx of unregulated Chinese-made products with poorly manufactured Lithium-Ion battery packs that were spotty at best and highly combustible at worst. Finally, in May, the product safety testing and certification organization UL officially certified the first hoverboard. The holiday season is fast approaching, and with it, the many festivities, decorations, and activities that run all winter long. But medical professionals suggest you may want to avoid having a little too much “cheer” before trimming the tree or hitting the slopes. Falls, fires, and sports injuries are among the most common reasons for emergency or urgent care visits throughout the holidays, reports find, and can be especially problematic in instances involving alcohol. If you’re considering getting one of the 200,000 weight loss surgeries that are performed every year in the U.S., you might want to hold off. A new study out of Cornell University has found that you’re likely at your lowest yearly weight right at this very moment. Recently published in the New England Journal of Medicine, the study analyzes data from nearly 3,000 people from three different countries around the world. Researchers collected data via WiFi-connected scales from 1,781 people in the U.S., 760 people from Germany, and 383 people from Japan. A lot of people fall ill during the holidays. As fall and winter are the peak of cold and flu season, these busy holiday times can feel less joyous with a fever and a stuffy, Rudolph-red nose. U.S. residents catch about 1 billion colds every year, accounting for more than three colds per person. Everyone has a friend or family member who loves to cook. They bring all of the best dishes to parties, and any dinner at their house is simply amazing. However, when it comes to buying gifts for your cooking-obsessed friends, things can get a little bit tricky. What do you buy for the chef who already seemingly has everything? Here are a few ideas to help give you a head start on your holiday gift shopping. Everybody has a rolling pin in their kitchen, but not many people can say they have one that’s adjustable.